I spent three of my five years at University of California, San Diego (UCSD) as a Resident Advisor (RA) for transfer student housing. These were my adult formative years, where I grew as a person, a student, and as a future teacher. In fact, during my third year as an RA I was a graduate student and student teacher, and my final month as an RA overlapped with the first month of my teaching career. I could write a whole blog post about being an RA, but I’ll save that for later. The point is, during the three-day equity and social justice portion of RA training each year, one of the facilitators constantly stopped us for check-ins for “where we were, where we are, and where we’re going.” I now apply that concept to my own personal reflections. Third year teacher, finished first semester teaching AVID. Just starting to use Twitter, participated in a few chats. I was barely getting my brain around the idea of connecting with teachers from other states and countries. I had just started presenting at conference, notably a CUE-Tip at Annual CUE (March 2014) and 2 full sessions at Fall CUE (October 2014). Alicia Johal and I applied to present at more conferences for 2015, and were honored to represent our school and district. I currently teach 3 sections of 7th grade science and 2 sections of 7th grade AVID. On top of, that I am the Blended Learning Specialist (tech coach) at my school, which has become a whole new set of responsibilities. 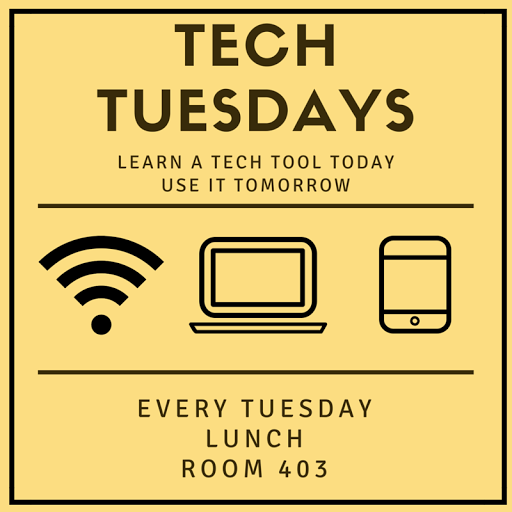 I started a weekly Tech Tuesday lunch (read more here) for the teachers at my school. We meet in my room to eat together and share tech tools and goals. I leave it open-ended, although many times teachers come to me with requests of what they’d like to work on. I have tried out new methods, strategies, and tools in my class that constantly push my boundaries and comfort zone as a teacher. This includes mock interviews with my AVID kiddos, green screen videos in science, and using Explain Everything for students to demonstrate their knowledge and application of scientific concepts. We embarked on the EduRoadTrip journey with Justin Birckbichler and Greg Bagby in July! We have released 14 episodes and 5 rest stops so far, and have many more engaging interviews scheduled for 2016. We’d love for you to follow along on iTunes or Stitcher. I began #FlyHighFri in an effort to infuse more purposeful positivity into our schools and work days. Read more about it on my blog. Honestly, right now I’m a little over-committed. I am learning how to say “no” to opportunities if they are not the right timing, or if I simply don’t have the brain energy to put in. This has been a difficult process for me, and I am constantly reaffirming my decisions when I decline a request. I recently got Chromebooks and Spheros from DonorsChoose, and I am excited to spend more time coding with my students next semester. Now that I’m a little more comfortable blogging, I will attempt to blog every two weeks or so. I’m thankful to the #TribeofBloggers and #YourEdustory for motivation, community, and support. I’m looking forward to an exciting and top-secret collaboration project with Justin Birckbichler! Make sure you follow us both on Twitter (Me // Justin) for the latest news. Most of all, my biggest resolution for 2016 is to better balance my personal and professional life, and spend more quality time with my boyfriend, my puppy, my friends and family. This includes intentionally turning off electronics and relaxing! 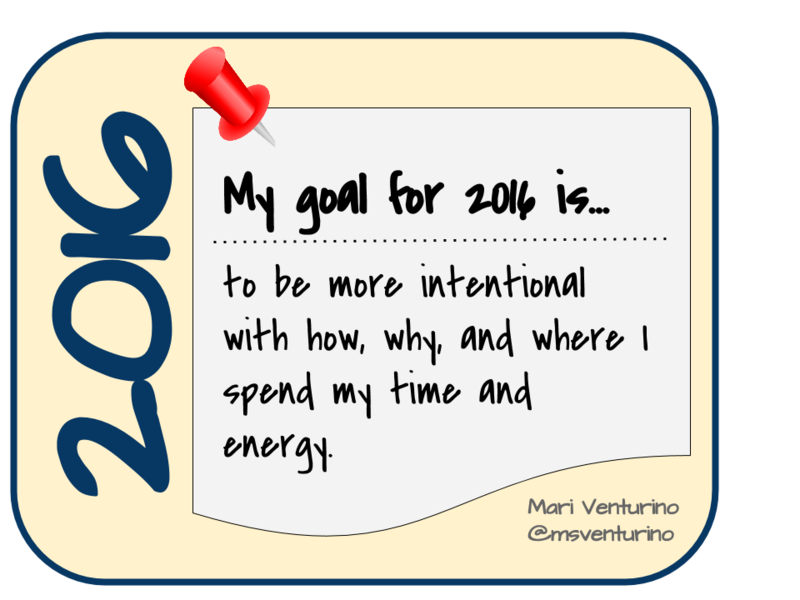 What are your resolutions and goals for 2016? Who is going to support you and hold you accountable?